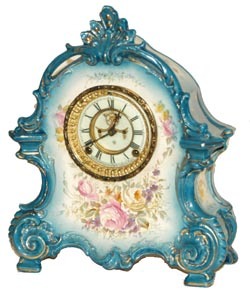 Ansonia Clock Co. Royal Bonn, "La Bretagne", C. 1895. Evidently one of the earlier porcelains Ansonia made. It is also another big one, standing 15" high, 12.5" wide, and another of their excellent stylish cases. At the top is the shell design and the two bridges, none of which has been broken. Think of the times a klutz like me, moved or handled the clock in the last 100 years. There are a couple of suspicious places where the original paint did not cover completely and the white underneath porcelain is showing. It was fired that way and has not been touched up with paint as it could easily have been. Insignificant really, I just mention it. Many of the old cases have molding or firing flaws. Like #283 it is blue all over, flowers everywhere, and more gold accents than usual. Excellent 2 piece porcelain dial, open escapement, original hands, and back door. The bezel has not been polished, should be. Ly-Ansonia, page 616.